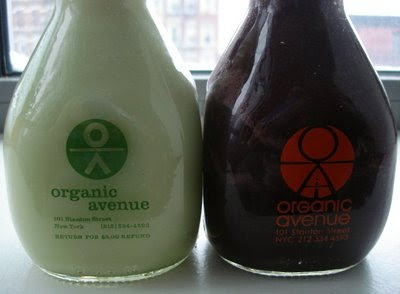 Organic Avenue NYC: $6 per Eight-Ounce Juice, and Still Thriving! On the LES of NYC, sits a tiny gem of a store called Organic Avenue. It is a brightly lit store on Stanton street, a few doors down from the popular restaurant The Stanton Social, and a few blocks up from Teany, a Moby-made-it-famous vegan tea joint on Rivington street. Inside the store you'll find the fridge shelves stocked with made-fresh-daily pressed raw juices. Walls are lined with wellness books and gadgets. Celebrity clientele grace the pages of their press clippings. Supplements. Denise Mari, genius wellness guru, is at the helm of this ship. There are Clothes. Snacks. All raw, vegan, organic, live, you know - good-for-you. And everything is that trendy buzzword, green. Good for the planet. 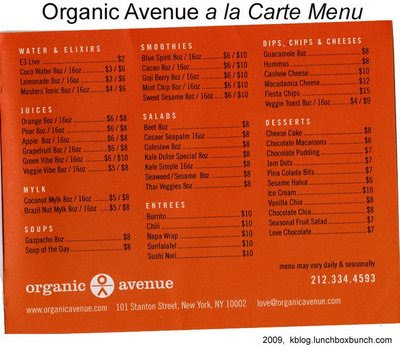 Check out the Organic Avenue a la carte menu, smoothies are $10 for a large. A juice can be $6 for a relatively tiny eight-ounce swig of liquid. How in the world is this business surviving in our bleak economy? There is indeed an audience for Organic Avenue's wellness haven! You may read controversy about vegan diets, gossip over the danger of juice fasts or even bad press that raw vegan food tastes awful. But the truth is that the trend of health and veganism is indeed catching on. A recent survey found that in the United States, 1 in 200 kids are vegetarian. There is a huge population of vegans in NYC. And it seems to be the trend nowadays to embrace all things green. Even meat-eaters are becoming more food-conscious of the new face of today's farmer. Hey it's not just little old me people. Starbucks knows wellness is in. They just launched their Tea Time featuring the London Fog tea, and healthy flowering-tea-bags. Leading companies all over the place are going green. Health and wellness for the environment is on the top of everyone's 2009 list. And that bleeds over into health and wellness for our bodies, minds and spirits. 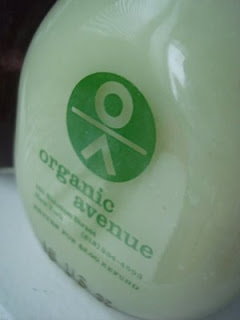 Back to Organic Avenue and its products. It has smoothies, juices, soups, snacks, desserts, dressings and even 'burritos'. I adore their blueberry smoothie and I can't get enough of their best-in-the-city fresh coconut water. I also love their raw vegan sunfalafel. LOVE is their main attraction. LOVE is the meal delivery program (or pick-up) where they supply all the food you need for five days. There are a range of levels to choose from. From LOVE easy to LOVE deep. You can go all juice fast, or 2,000 calorie a day food-heavy! It is around $350 for the five days. Given NYC food prices, it's not bad. If you were to buy everything a la carte it would be a lot more expensive. Oh, and they offer a membership program. I highly recommend joining to get the discount. A final word about cost. Since it is on everyone's mind and sometimes healthy food can be the first 'luxury' item to get chopped off your household budget. $6 FOR 8 OUNCES OF COCONUT WATER MAY SOUND NUTS! But once you try it, you'll be so in love with the way you feel, that the wellness-buzz becomes addicting. Eating food in lower quality forms will seem hard to do. And soon you'll feel and see the wellness change in your body. Really. I'm not just spewing vegan schmaltz here. Try vegan raw food at its best and experience what your body was meant to crave.